Torn made me wonder how far I would go to protect my brother. 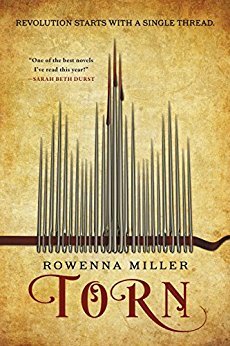 Torn (The Unraveled Kingdom) is about a seamstress torn between her brother and her lover, her ancestry and her adopted culture, her class and her ambition, her employees and her employers, who she is and who she wants to be… Well, she’s torn just about every way a person could be torn. At first I waffled about how I felt about Torn, as I wondered just how gullible Sophie could be. But then I asked myself, if it were my brother, how far would I go to protect him? Would I let myself be used? And I had to admit, I might do some foolish things if I thought it would keep my brother alive. And that really helped me identify more with the story and accept that Sophie was not making the best decisions. (Frankly, I was thinking of ways to do certain people in a bit early in the book, but I also had the advantage of knowing it was a book!) Torn is basically about the French Revolution in an alternate world. What would it have been like for the people who were neutral, who really didn’t want to take sides, who saw both sides? What would it have been like if your brother was one of the leaders of the Revolution, and you didn’t agree with his actions? What would you do to save his life? Sophie is a seamstress who has managed through talent and hard work to open her own shop and who works her way up to commissions from the wealthy and the nobility. She has a special talent; she can sew good luck charms into the clothing. Sophie works hard to have her shop succeed and to employ other seamstresses while hoping to improve their lot through their wages and through the training that will help them open their own shops one day. Her brother is a revolutionary, but in many ways he’s selfish and short-sighted, willing to take advantage of Sophie to further his cause. And while the revolution is brewing, Sophie, who has rejected all thought of romance before this, finds herself attracted to not just any noble, but the son of the heir to the throne. Then her brother is kidnapped and the only way to save him is to compromise her beliefs and work with curses. The character building is intense and the world-building is rich and detailed in the immediate surround: houses, clothing, etc. Torn is light on some of the background history, while the historical context expands as the book progresses. I expect to learn more about the various countries and types of magic in the next book. Overall, I think fans of historical romance, fantasy, political intrigue, and even the French Revolution will enjoy this take on a society torn between the classes. It’s a wonderfully nuanced read. I’m definitely looking forward to the next book. Highly recommended.